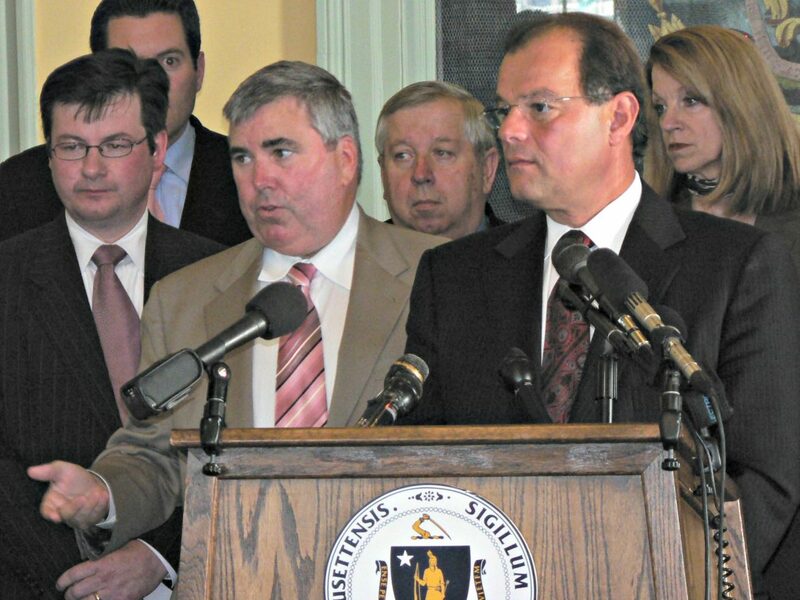 FORMERLY OF BEACON HILL: With Rep. Brian Dempsey's announcement last week that he is leaving the State House for a private sector job, all the Beacon Hill leaders at this 2005 press conference will have departed the Legislature. The group included (from left) Sen. Barry Finegold, co-chairs of Telecommunication, Utilities and Energy Rep. Dempsey and Sen. Michael Morrissey, Senate Health Care Financing Chairman Richard Moore, Senate President Robert Travaglini, and Senate Ways and Means Chairwoman Therese Murray. BOSTON — While he never spoke about it — or spoke much at all unless it was to explain a bill to his colleagues in caucus — state Rep. Brian Dempsey’s mere presence in the second-floor offices of the House Ways and Means Committee kept the wolves at bay. As long as he held the chairmanship of that powerful committee, House Speaker Robert DeLeo did not have to worry about the kind of behind-the-scenes maneuvering that has periodically frustrated and undermined speakers in the past. But everyone knows what they say about the best-laid plans of mice and men. Dempsey, the Haverhill Democrat who announced last week that he accepted a job offer from lobbying firm ML Strategies [see story below], could have been speaker by now had DeLeo not preempted his term-limited exit from the Legislature by wiping the very eight-year limit he put into the rules in 2009 off the books in 2014. Now the speaker says he’s running for re-election in 2018 and doesn’t have “any view in my mirror” in terms of an exit strategy. Dempsey said DeLeo’s prolonged stay had nothing to do with his decision to take off his lapel pin, loyal until the end. But it’s hard not to wonder what if. DeLeo now has to choose a new Ways and Means chairman, or chairwoman, knowing that whoever he elevates will instantly be viewed as a contender to become the next speaker. It also appears certain that DeLeo will face pressure from groups like the Black and Latino Caucus, the Women’s Caucus and the Progressive Caucus to pick a minority or a woman or someone more ideologically left of center. Some of the names wafting through the halls as possible Dempsey successors include Economic Development Committee Chairman Rep. Joseph Wagner, Education Committee Chairwoman Alice Peisch, Telecommunications Committee Chairman Thomas Golden, State Administration Committee Chairman Peter Kocot and Transportation Committee Chairman William Straus. Gov. Charlie Baker learned of Dempsey’s plan to leave the Legislature when Lt. Gov. Karyn Polito called him on his cellphone in Providence, where the governor was taking part in the National Governors Association Summer Meeting. The governor spent most of the day Thursday huddled behind closed doors with his fellow governors, who had one eye on their conference agendas and another on their smartphones as details of the U.S. Senate’s Obamacare repeal rewrite filtered out. Vice President Mike Pence and Health and Human Services Secretary Tom Price were both expected in Rhode Island over the weekend to sell the governors on a plan that already appears in jeopardy. Administration officials said the governor was also still working through the options for how to handle MassHealth in the near-term before any possible federal changes come over the transom. Baker said last Monday he was unsure whether he’d sign off on $200 million in new assessments on employers, agreed to by the Legislature, without the MassHealth eligibility reforms he sought as part of a compromise with the business community. While Baker is expected to sign the budget, at least in part, on Monday, earlier this week he signed a hastily-approved $26 million spending bill to make sure that attorneys who handled cases for indigent clients last fiscal year could get paid. The state’s penchant for underfunding the Committee for Public Counsel Services account caught up to it this month when CPCS ran out of money to pay the lawyers for their work. The blockbuster announcement that House Ways and Means Chairman Brian Dempsey plans to resign shook up the legislative leadership ranks on Beacon Hill, opened up a power base in the House, and may kick off jockeying for pole position in the line of succession to the speakership. House Ways and Means Chairman Brian Dempsey and Speaker Robert DeLeo, who were freshman lawmakers together back in 1991, made for a powerful team. ML Strategies approached him, Dempsey said, and asked that he consider joining them in the chief operating officer role and Dempsey said he told them he would be interested in talking about that possibility further. “I certainly wasn’t looking for a position,” he said. Things moved quickly, Dempsey said. He and ML Strategies sat down last week, he said, and the firm made an offer. On Tuesday, Dempsey filed a letter with the House clerk disclosing that he was “negotiating prospective employment opportunities” with ML Strategies. Dempsey has served on Beacon Hill since 1991 and his imprint is all over the state’s laws. He is the primary author of the last seven House budgets, including the state’s first spending plan greater than $40 billion. He co-authored the 2011 expanded gaming law, co-wrote the 2008 Green Communities Act, and helped write a $100 million economic stimulus package in 2003. He appears to be filling a role at the firm left by the departure of former U.S. senator and chief legal counsel to Gov. Deval Patrick Mo Cowan. Cowan started at ML Strategies with a similar title to the one Dempsey will take on before being promoted to CEO. He left this year for a job at General Electric. Some of ML Strategies’ biggest clients include General Electric, Spectra Energy and Wynn MA, which is building what is slated to become the second resort casino in Massachusetts in Everett when it opens in 2019. Prior to becoming Ways and Means chairman, Dempsey headed the Economic Development and Emerging Technologies Committee for the House and helped write the expanded gaming law that legalized casinos in Massachusetts. Many have considered him as a possible successor to the long-serving House Speaker Robert DeLeo, who trusted Dempsey with significant responsibilities. “It appears to be a, you know, just a wonderful opportunity. I wish him the best. I’d have to say that in terms of the job he did as chair of Ways and Means, he’s been one of the best that I’ve ever seen at it,” DeLeo, who served as Ways and Means chairman himself before becoming speaker, told reporters Thursday. 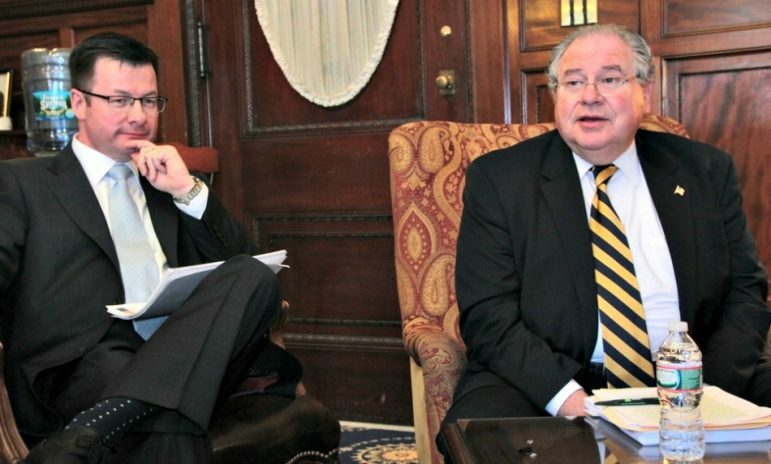 “That process will start now in earnest,” DeLeo said of finding a successor. 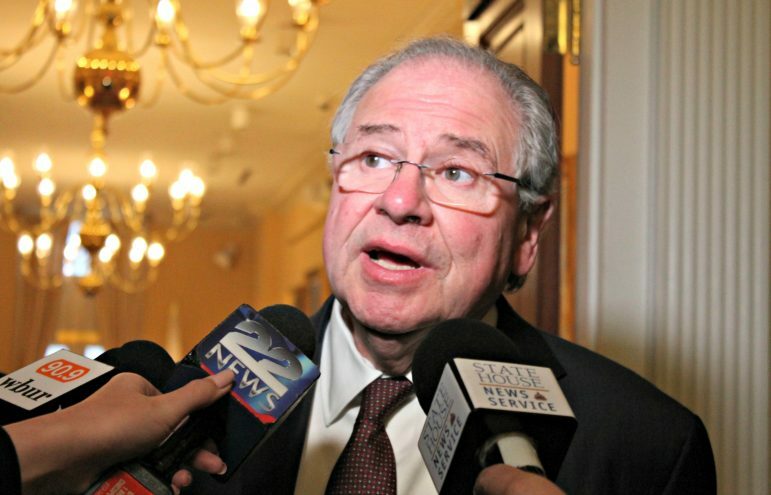 DeLeo in 2011 tapped Dempsey for the Ways and Means chairmanship in a stunning move in which he simultaneously stripped former Rep. Charley Murphy of the Ways and Means post. At the time, Murphy had spoken to colleagues about his interest in a potential future bid for the House speakership. Marijuana law negotiators met Friday but wrapped up without reaching agreement on a consensus bill. But 14 days after their deadline passed a final deal is in sight on a marijuana bill, one of the House negotiators said Friday on his way into a conference committee meeting. “I’m very optimistic. I think we’re very close. And we’re going in now to review everything and hopefully come up with the final agreement,” Braintree Rep. Mark Cusack told State House News Service. After passing competing bills in June to overhaul the marijuana ballot law, House and Senate negotiators missed a June 30 deadline to deliver a bill to Gov. Charlie Baker. After the afternoon meeting, Sen. William Brownsberger told reporters that the conference committee plans to meet again at 2 p.m. Monday. The House bill would raise taxes on marijuana sales to 28 percent, while the Senate stuck with the 10 to 12 percent that voters endorsed in November. 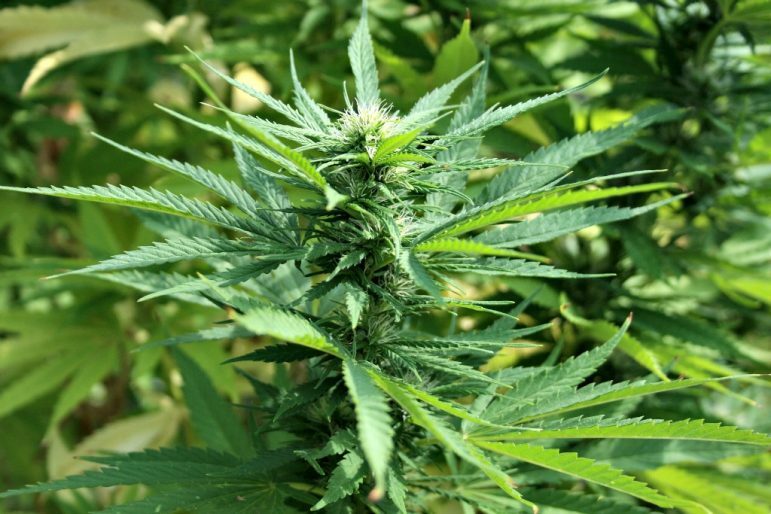 The House bill would also allow local officials to ban marijuana stores from town, while the Senate bill would require a referendum to ban pot shops. Higher education students and advocates continued their quest to make public colleges and universities free or debt-free in Massachusetts by asking lawmakers to start by providing one full year of tuition and fees at community colleges, state universities, and the University of Massachusetts system. Public Higher Education Network of Massachusetts (PHENOM) representatives testified in support of a bill filed by Rep. Sean Garballey (H. 3000) that would create a Finish Line Scholarship Program that would provide “the entire cost of tuition and fees for one year other than the first, in a program leading to an associate’s or bachelor’s degree at a Massachusetts public college or university” to Massachusetts residents whose family income is less than twice the state median family income. Bears said the program would be an important first step towards the goal of free or debt-free higher education in Massachusetts. Sen. Jamie Eldridge on Thursday testified on a bill (S. 681) that would provide a free public college education for any student from a family earning less than $200,000 per year — covering the cost of tuition, fees, housing and transportation, Eldridge said. “Clearly it’s a bold bill,” he said. Others who testified in favor of free or debt-free higher education pointed to the 4 percent income surtax on income over $1 million that is expected to be on the 2018 ballot, and a proposed tax on certain higher education endowments as sources of funding to pay the costs of free public higher education, which Bears pegged at between $500 million and $700 million annually.